Here is some geeky brain science stuff for your weekend reading pleasure, courtesy of Frontiers in Consciousness Research, an open source journal for cutting edge research. This is the stuff that excites me - researchers are finally starting to look at the intersubjective element in consciousness - we are not conscious in a vacuum. Dan Siegel and his cohort is already working one angle of this in his interpersonal neurobiology, and his work is very useful to me as a therapist in training. Understanding what is happening in our brains during that interpersonal exchange is important. It is equally important to know what is happening intersubjectively in that space. Consciousness is typically construed as being explainable purely in terms of either private, raw feels or higher-order, reflective representations. 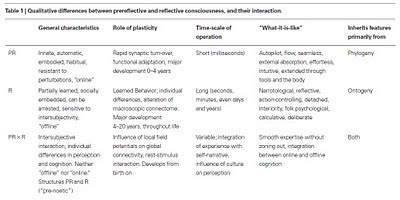 In contrast to this false dichotomy, we propose a new view of consciousness as an interactive, plastic phenomenon open to sociocultural influence. We take up our account of consciousness from the observation of radical cortical neuroplasticity in human development. 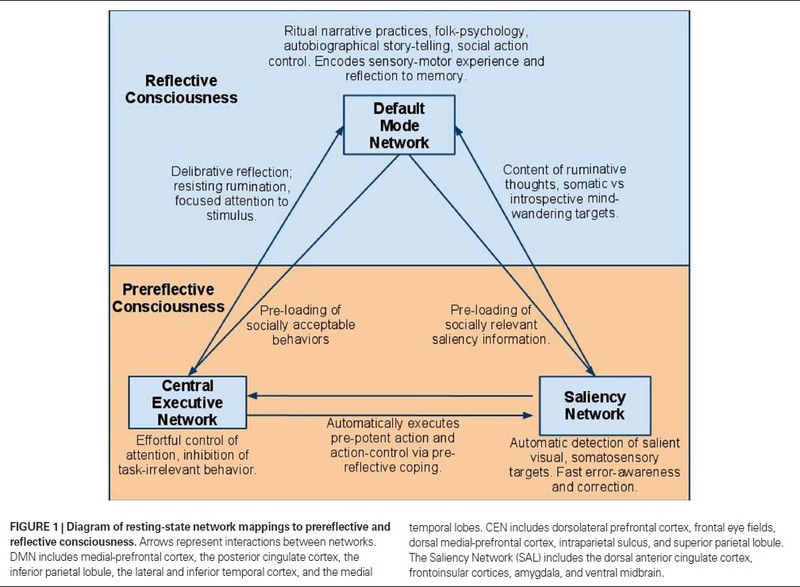 Accordingly, we draw upon recent research on macroscopic neural networks, including the “default mode”, to illustrate cases in which an individual’s particular “connectome” is shaped by encultured social practices that depend upon and influence phenomenal and reflective consciousness. 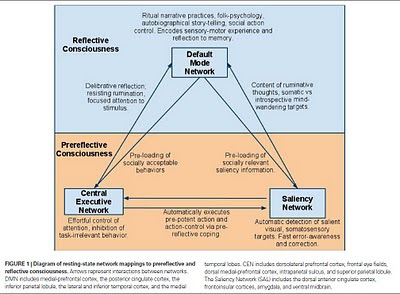 On our account, the dynamically interacting connectivity of these networks bring about important individual differences in conscious experience and determine what is “present” in consciousness. Further, we argue that the organization of the brain into discrete anti-correlated networks supports the phenomenological distinction of prereflective and reflective consciousness, but we emphasize that this finding must be interpreted in light of the dynamic, category-resistant nature of consciousness. Our account motivates philosophical and empirical hypotheses regarding the appropriate time-scale and function of neuroplastic adaptation, the relation of high and low frequency neural activity to consciousness and cognitive plasticity, and the role of ritual social practices in neural development and cognitive function. Andrew P. Smith has posted an article on the directionality of evolution over at Tikkun - he references integral theory in general and Ken Wilber's work in particular. However, Wilber seems to be a simple jumping off point, after which he is fleshing out the basic idea that Wilber calls "Eros" with a more scientific model and explanation that does not rely on a New Age image or metaphor. This is a very long article, so I am only sharing a small part - read the whole article at the Tikkun site. Reflections on evolution and consciousness from "the Integral World"
David Lane is the most recent of several authors at this site to point out the flaws in Ken Wilber's view of evolution. * In doing so, he joins an even longer list of scientists, philosophers and other academics who—beginning with the celebration of the 150th anniversary of publication of The Origin of Species two years ago—have spoken out clearly and forcefully in support of modern evolutionary theory. We need to address this question not simply to reassure people that life is more than just a matter of chance. Predictability goes to the heart of what science is and does. Science can be succinctly defined as the attempt to identify the causes of phenomena. But the process does not stop there. When we think we know what causes a phenomenon, we attempt to use this knowledge to predict other phenomena, and ultimately, by causing them by our own actions. Indeed, scientific theories are generally validated only by the successful predictions they make. Einstein's relativity theory received an immense boost when it was demonstrated that the gravitational pull of celestial bodies did in fact result in the curvature of light. Conversely, modern string theory, for all its mathematical elegance, has failed to displace other so-called theories of everything (TOE) because of the difficulty of testing any predictions it might make (Smolin 2006). Nevertheless, a key aspect of evolution is that it is not simply an historical process, but an ongoing one. It would of course be highly desirable that a theory of evolution should be capable of not just accounting for what forms of life appeared in the past, but for providing some insights into what might emerge in the future. This is where randomness becomes a problem. This randomness occurs not only in the gene mutations that are the source of hereditary variation, but perhaps also to some extent even in the selection process. The late Stephen Jay Gould, who referred to this latter kind of chance as contingency (1990), argued that random events in the past sometimes have had a major effect not just on what variants appeared, but on whether they survived. If we could rewind the evolutionary tape, Gould suggested—go back to any arbitrary date in the distant past and have evolution begin anew from that point—the results would be very different. Like most evolutionary biologists, though, Gould was interested in the details of evolution—the specific types of structural adaptations developed by organisms. While it may be beyond our power to predict these in advance, what about more general trends? Perhaps there was nothing predictable about the emergence of a four-limbed creature that learned to walk upright and manipulate objects, but was the evolution of a brain, or some similar organ capable of processing information about the environment, inevitable? What about consciousness? We can easily appreciate my definition of complexity by considering what is often taken to be the most complex form of existence on earth: the human brain. With its billions of neurons and trillions of synaptic connections among these neurons, the brain clearly is capable of existing in an enormously large number of different states. Each state is distinguished from every other by the particular set of neurons that are active at that moment, and in the view of modern neuroscience, any particular such neuronal state—or at any rate, many of them—represents some specific form of information. Thus when we think or feel certain thoughts or emotions, a certain pattern of activity occurs in our brains, and this pattern is constantly changing as our thoughts and feelings change. Though the relationship of brain activity to thinking, feeling and other cognitive properties is not entirely understood, it's apparent that the enormous variety of behavior we are all capable of is closely related to the enormous number of different states our brains can exist in. Defined in this way, it seems obvious that there has been a major increase in complexity during evolution. If we consider the progression: small molecules, macromolecules, cells, invertebrates, vertebrates, humans—it's clear that over time forms of life have appeared that, by this definition, or indeed, anyone's reasonable definition, are more complex than any that preceded them. What makes this view controversial, though, is the implication that there is an inherent drive or purpose to evolution—shades of Wilber's eros—that produces this complexity. Some authors, like Robert Wright (2001), have embraced this idea, and find evidence for it throughout the history of both natural and human social evolution. Others, such as Gould (1997), have argued strenuously against it, conceding that while there has been some increase in complexity over evolutionary history, it results from chance, not any trend. In Gould's metaphor, evolution began with its back against a wall, representing zero or minimum complexity. Any change at all had to result in some increase, a step away from this wall. I think the most reasonable position here—and the one probably accepted by the majority of scientists—lies between these two extremes. While there may not be an intelligent force guiding evolution to create life forms of increasing complexity, several scientific studies have provided evidence for an increase that does not appear to be a result of just the statistical fluctuations that Gould implied (McShea 1996; Adami 2002). David Lane, referencing Hermann Muller, points out that a process of gradually accumulating variations has the potential to create life forms of greater complexity. I would go further and say that an increase in complexity can often result in greater fitness, so that complexity is not simply possible, but often favored. Richard Dawkins (1997), one of today's strongest proponents of Darwinism, essentially made this point in a debate with Gould. Furthermore, other evolutionary processes that do not involve random variation and natural selection have also been described that could result in an evolutionary increase of complexity (Cavalli-Sforza and Feldman 1981; Kauffman 1993; Barabasi 2002; McShea 2005; Jablonka and Lamb 2005). I will be discussing some of these other processes later. Those who argue against this idea, that natural selection very often results in increasing complexity, frequently cite the fact that some of the simplest life forms appear to be among the most well adapted. Bacteria, for example, have survived on earth for billions of years, and might well continue to survive under conditions that could result in the extinction of most or all multicellular organisms, including our own species. But those who make this argument generally overlook the fact that though bacteria are far simpler than any multicellular organism, they represent an enormous increase in complexity over what came before them—the primordial abiotic soup of organic molecules. In fact, most of the organic molecules found within bacteria and other kinds of cells today no longer exist on earth outside of these cells. They have been able to survive only by virtue of being part of a lifeform that can control, for example, the degradative processes that quickly destroy these molecules when they are found outside of living cells. So the complexity increase manifested in the evolution of bacteria, and in the still more complex eukaryotic cells that evolved later, represented, from the viewpoint of the cell's macromolecular components, a clear case of greater adaptive fitness. If natural selection seems capable of at least occasionally creating life forms of greater complexity, how exactly does it do this? It turns out that there is often a very simple answer: through combination of pre-existing life forms—whether they be molecules, cells or organisms—into societies. Such combination can potentially result in an enormous increase in the number of possibilities or states. This can be demonstrated very easily mathematically.. Suppose we begin with a life form—what Wilber, and others including myself would call a holon—that can exist in just two different states. For example, a nerve cell might either be active, sending an electrical impulse down its axon, or inactive. If we combine this neuron with a second neuron, the combined system can exist in four different states—both neurons active, both inactive, or one or the other active. More generally, if a system consists of n components or holons, each of which can exist in x different states, then the total number of states that system may theoretically exist in is x raised to the nth power: xn. In other words, as more components are added, the complexity of the system increases exponentially. So the first lesson here is that complexity is created by social organization. Societies—and I use this term very generally, to mean not simply human or even animal societies, but combinations of molecules and cells as well—are generally more complex, and frequently, far more so, than any of their individual members. This is a point that has been lost not simply on Wilber—who clings to the erroneous and easily disproven idea that societies always have the same degree of complexity (and level of hierarchical development, an issue I will address shortly) as their individual members—but to some extent, I believe, on the entire evolution community. Cool segment from yesterday's Science Friday on NPR's Talk of the Nation. Brian Greene is the author several excellent books, including his newest book on the nature of a possible multiverse, The Hidden Reality: Parallel Universes and the Deep Laws of the Cosmos. So there's a version of multiple universes that comes from string theory, and it's called the Brane Multiverse, B-R-A-N-E. And that comes from the word membrane, which is one of the recent realizations in string theory is that the ingredients in the theory are not just the little, tiny vibrating strings that we've, for instance, spoken about in the past on this program. But the theory also has giant membranes which may have two dimensions, like a giant sheet, or three dimensions, a three-dimensional membrane. We call it a three-brane. And that suggests the possibility that all we know about our universe may exists on a giant membrane. I like to think of it as a giant slice of bread. So imagine every star, every galaxy's on a giant slice of bread, with other slices of bread out there, other universes, other brane universes nearby in a giant, cosmic loaf. 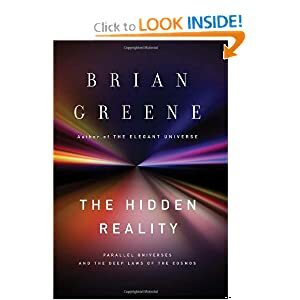 I have enjoyed Greene's earlier books (particularly The Elegant Universe: Superstrings, Hidden Dimensions, and the Quest for the Ultimate Theory and The Fabric of the Cosmos: Space, Time, and the Texture of Reality), so I'll have to read this one as well. In a new book, mathematician and theoretical physicist Brian Greene explains the concept of multiverses, and why some physicists believe there could be more than one universe. Plus, a look at the hidden universe of Greene's desk, this week's "Desktop Diary" video pick. IRA FLATOW, host: This is SCIENCE FRIDAY. I'm Ira Flatow. Up next: physics to make your hair hurt in a, really, a good way. Now, you're going to want to hear about this. For example, think about this: Is the universe we are living in the only one? What if, when you got into your car this morning to drive to work, another you in another universe got into a different car and drove to the beach instead? Seems hard to believe and maybe more like science fiction, but some theoretical physicists say we might exist in one of many universes, or in a multiverse, as they call it. So what if the universe, as we know it, is really just one of many universes? What does that tell us about the laws of physics here in the universe we know of? Can we ever test the theory of a multiverse? And ultimately, does this mean we need more than one Miss Universe pageant? Joining me now to talk about it is my guest - Brian Greene, having a good laugh with me, here. He is professor of physics and mathematics at Columbia. He's also author of a new book, "The Hidden Reality: Parallel Universes and the Deep Laws of the Cosmos," back in our New York studios. Thanks for being with us here today. Professor BRIAN GREENE (Physics and Mathematics, Columbia University; Author): Oh, it's my pleasure. FLATOW: Do we need another Miss Universe, kind of? Prof. GREENE: I guess so. I didn't - I never thought of it that way. FLATOW: This is a serious idea, right? It's all through your book that there could be more than one universe. Prof. GREENE: ...the universe meant everything, every star, every galaxy. So what would it mean to have more than one everything? But from a number of directions, our mathematical research is suggesting that what we have thought to be everything in the past, well, that may be a small part of a much grander whole that may have other realms rightly called other universes. FLATOW: And where would they have originated? Prof. GREENE: Well, it depends on the proposal. Actually, in the book, I go through, actually, nine different ways in which physics has come upon this idea. The simplest is perhaps there could have been more than one Big Bang. We think of the Big Bang as creating our universe, but as we have studied the Big Bang in more and more detail, the math is suggesting that the Big Bang may not have been a unique event. There may be many Big Bangs that happened at various and far-flung locations, each creating its own swelling, spatial expanse, each creating a universe -our universe being the result of only one of those Big Bangs. FLATOW: And you talk about three different kinds of universe. FLATOW: We don't say universi(ph), I guess - universes. Prof. GREENE: Yeah. We have definitely gone with the S as the plural. Prof. GREENE: But there are actually are these nine versions. One is from this multiple Big Bangs. Another very simple one to think about which aligns with your remarks about someone driving to the beach instead of going to work, arises from imagining that space goes on infinitely far. We don't know that it does, but that's an idea that people take very seriously, that it may go on forever. If it does, there's a startling conclusion that really hasn't received as much attention as I think it deserves, which is in any finite region of space, matter, particles, can only arranged themselves in finitely many different configurations. The metaphor I like think of is a deck of cards. You shuffle the deck, the cards come out in different orders, but there are only finitely many different orders. And that means if you shuffle the deck enough times, the order of cards must repeat sooner or later. Prof. GREENE: Similarly, in infinite space, the arrangement of the particles must repeat sooner or later, too. And, look, you and me, we're just collections of particles. So is the Earth and the sun. So if the particle arrangement repeats, then we are out there having this conversation. Prof. GREENE: ...there's all sorts of crazy stuff happening out there, and that is all compatible with this idea of space going on infinitely far. FLATOW: Is it possible to find any evidence of these universes at all? Prof. GREENE: That, of course, is the key question. And I should say that the book itself is not really a cheerleading book for the multiverse. It's not a multiverse manifesto. It's taking the idea seriously, because a large fraction of the theoretical physics community is taking this idea seriously and looking at it from all angles and asking those kinds of difficult questions. Can you test it? And there are some ways in which this notion could be tested. For instance, in the multiple Big Bang version that gives rise to different universes, it's possible that the different universes, as they expand, could collide with one another, sort of like - think of a bubble bath. Each of the Big Bangs gives rise to one expanding bubble in the cosmic bubble bath. Those bubbles can smash into each other. And if they did, if our universe got hit by another, had a fender-bender with another universe, that would send ripples going through the cosmic microwave background radiation - heat left over from the Big Bang. And astronomers are now looking for patterns in the microwave background radiation that might suggest that we did have that encounter in the past with another universe. That'd be a very direct way of establishing that other universes are out there. FLATOW: 1-800-989-8255. We're talking with Brian Greene, author of "The Hidden Reality: Parallel Universes and the Deep Laws of the Cosmos." You can also tweet us @scifri: @-S-C-I-F-R-I. And talking about multiple universes here, the Large Hadron Collider, it's going to do powerful experiments. Any possibility of seeing evidence of multiple universes there? Prof. GREENE: Yes. Absolutely. 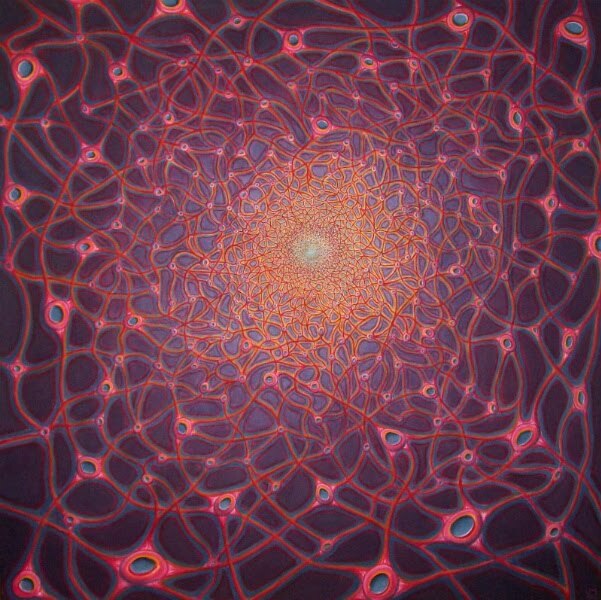 So there's a version of multiple universes that comes from string theory, and it's called the Brane Multiverse, B-R-A-N-E. And that comes from the word membrane, which is one of the recent realizations in string theory is that the ingredients in the theory are not just the little, tiny vibrating strings that we've, for instance, spoken about in the past on this program. But the theory also has giant membranes which may have two dimensions, like a giant sheet, or three dimensions, a three-dimensional membrane. We call it a three-brane. Now, to speak to your question: At the Large Hadron Collider, when protons slam against protons at very high speed, the math suggests that some of the debris created in the collisions could be ejected off of our brane, off of our universe. How would we know that? Well, the debris will take some energy with it, which means there'll be a little less energy in our detectors after the collision than before, a missing energy signature that could give evidence that we're living our lives on a brane, that there are other branes out there, that we are part of this multiverse from string theory. FLATOW: And some of these particles that disappear from - could be going into a - one of those dimensions, which string theory allows for. Prof. GREENE: They would - precisely right. So the other universes would be displaced from us. They'd be away from us by perhaps a millimeter or less, but in another dimension. So the dimensions that we know about would be on our piece of bread. The orthogonal directions that go from one brane to another would be the extra dimensions that string theory requires. The remarkable thing is, you say, well, if they're out there, why don't we just see those other universes that are right nearby? And the thing is, in string theory, light, the medium by which we see, can easily travel along our brane, our universe, but it can't jump off of our brane and travel between the brane universes. FLATOW: So it has to stay at the edge of the membrane. Prof. GREENE: It stays on the edge when you're thinking about the edge in those extra dimensions. But it can move all around universe. I can see you. I can see stars. All of those are light beams that are going along our slice of bread. You try to make the light jump off our slice of bread so you can see the other universe, the light won't do it. FLATOW: It just doesn't want to cooperate. FLATOW: 1-800-989-8255, talking with Brian Greene, author of "The Hidden Reality." You know, we hear - one of the most exciting things in astrophysics is talking about this dark energy stuff. My pet theory - and I have absolutely no reason to state(ph) anything with it - is if there's another universe someplace, could that not be attracting - that the - so it's an attractive force from the outside. It looks like it's a pushing force from the inside. Prof. GREENE: It's an interesting thought. And people have played with these kinds of ideas. I've never seen a version of that story that seemed convincing. Prof. GREENE: But people have done a version of that with dark matter that, I think, holds, perhaps, a little bit more promise. You know, we know that there's matter out there that doesn't give off light, but affects us gravitationally. Could that be matter, say, on a nearby brane, a nearby slice of bread universe? Gravity can travel from one brane universe to another. Could it be responsible for the additional gravity that we know must be out there causing these stars and galaxies to move as they do? But the matter would be invisible, because light doesn't travel from brane to brane. That's a proposal, too, that people have studied. FLATOW: Mm-hmm. Tell us about this - one of the kinds of universes that you have in there is the holographic universe - hard to imagine, for many of us. Prof. GREENE: Yes. That is, in many ways, the strangest proposal of all, but it is one that may have the chance of being tested in the next few years. In fact, we're doing tests right now at the Relativistic Heavy Ion Collider. Experiments there are actually probing this idea. And the idea is this: All that we know about in this three-dimensional world around us, this proposal suggests, may actually be a holographic-like projection of laws of physics that exist on a thin-bounding surface that surrounds us. Just like an ordinary hologram, that's a piece of thin plastic. You illuminate it the right way, it creates a realistic, three-dimensional image. The math of string theory and the math of black hole physics suggest that everything we know about may be a similar holographic projection of fundamental information that exists on a large surface that surrounds us. Now, you may wonder: Where does this crazy idea come from? FLATOW: You noticed the silence. Prof. GREENE: It comes from an interesting puzzle, which comes from black holes. When you throw something into a black hole, we know it disappears. But the puzzle has been: What happens to the information that the object may contain? Let's say you throw your laptop or your iPad, whatever, you throw it into a black hole. Where does the information that that object contains go? Now, one suggestion from Stephen Hawking a long time ago is it simply disappears. The problem is, that conflicts with quantum mechanics. It creates tension with quantum mechanics. So people like Leonard Susskind and Gerard 't Hooft, you know, they study this for a long time. And they concluded that what actually happens to the information is it gets smeared out on the surface of the black hole. Prof. GREENE: So your iPad, whatever, it goes into the black hole, but a copy of the information is smeared on the surface. That means that information on a bounding surface can describe a three-dimensional object that lives inside. And we believe what's true for black holes may be true for space more generally. We may be three-dimensional objects described, just like your iPad, that go into a black hole by information on a big, two-dimensional surface that surrounds us. FLATOW: Do you think we'll ever know the real answer to any of this? Prof. GREENE: Well, this particular proposal allows us to perform certain calculations that are otherwise completely impenetrable, to do with what will happen when gold nuclei slam into each other at very high speeds - which is what happens at the Relativistic Heavy Ion Collider out there in Long Island. The calculations are too hard to do in the traditional rote. But if you use this holographic version to translate the calculations into this bounding surface on the interior of this framework, you can do the math. The math makes predictions. And so far, the predictions are closer to the experimental data than any other approach that we have. FLATOW: Wow. Talking with Brian Greene, author of "The Hidden Reality," on SCIENCE FRIDAY, from NPR. And joining us now is Flora Lichtman, our digital video editor, who -you look - with our Video Pick of the Week. And it's a special one, Flora. Why don't you introduce it? FLORA LICHTMAN: It is a special one. Hi, Dr. Greene. LICHTMAN: This week's video pick is second in our series of desktop diaries. And in this desktop diary, we explore the hidden reality of Dr. Greene's desk. FLATOW: It wasn't very hidden, was it, the desktop? LICHTMAN: No, it wasn't very - it's a very tidy workspace, Dr. Greene, very, very tidy, indeed. In fact, we have a little piece of audio from that interview. Dr. GREENE: When I was five, six, you know, my dad would send me these 30-digit-by-30-digit multiplication problems. And I would spend a weekend doing them, you know, these huge pieces of paper, like, 30 digits by 30 - you know, that's a lot of writing. But to get to answer at the end that no one had seen before was exciting. Now, look, no one had seen it before because there is no point in multiplying those numbers together. But I didn't care. It was just this big, spectacular game. LICHTMAN: So I was curious, you know, is there an element of this spectacular game in the kind of work that you do now? Dr. GREENE: Well, in a sense, yes, in that much of what we're discussing here and much of what I do in my day-to-day life is mathematical calculations. But there was a moment when I was growing up - older than five or six, but 12 or 13 or so - when I realized, because people taught me, that math can actually describe what's out there. And that changed math for me completely. It became much more than a game. It became a gateway to try to understand what's actually out there. And that's what really thrills me about these ideas. Yes, they come from math, but time and again, we have found that the math really can explain what we see. FLATOW: And it does very - your desk, we would send Flora to do - your picture of your desk, and she came back with this wonderful, wonderful video, showing your environs that you work in. Dr. GREENE: Yes, I do. LICHTMAN: ...sort of a throwback. LICHTMAN: You didn't clean up for us? Dr. GREENE: No, I did not clean up for you. I can't stand clutter. I can't stand piles of stuff. And whenever I see it, I basically just throw the stuff away. Dr. GREENE: Oh, it is a change. Yeah. When I was in college, it was completely different. In fact, there's a picture of my dorm room in the college yearbook as the most messy, most disgusting room on the Harvard campus, where I was an undergraduate. But I got to a point where I get fed up with it all, and I'm very digital. I'm this or that. And now, I'm Mr. Neat. FLATOW: And you have multiple computers on your desk. Dr. GREENE: I do. I do. That's correct. FLATOW: Does each one have a different function, or do you just use them all? Dr. GREENE: No. There are some that have more powerful programs installed on them, like Mathematica, which when I do calculations that are not really amenable to pen and paper, pencil and paper, are done in those kinds of calculational environments. So some are more powerful for that sort of an undertaking. LICHTMAN: You know, one thing I wanted to ask you, because you use math to sort of tell this story or follow it to these, you know, speculative stories, do you feel like math is a creative act? Dr. GREENE: I think math is a hugely creative field, because there are some very well-defined operations that you have to work within. You are, in a sense, straightjacketed by the rules of the mathematics. But within that constrained environment, it's up to you what you do with the symbols. How you go to the next step? So rather than allowing your imagination just to run freely and wild -as you can in some areas, to great effect: screenwriting and writing fiction and things of that sort - here, you can allow your imagination to run, but it has to run within these very strict confines. And that's why when the math says there may be other universes - you know, the things I describe in the book - we physicists sit up and take that seriously. We don't believe it until there's observational support. But when the math tells us something, we listen. FLATOW: Do you think of yourself as the Stephen Hawking of our time? Dr. GREENE: No, no. I mean, you know, you're talking about, you know, genius upon genius. And, you know, I try to make my contributions, however small they may be. But it's just exciting to be part of what I consider a species-wide quest that we have been on for 2,500 years, to understand reality better. FLATOW: And if you want to understand Brian Greene's reality better, I suggest you pick up a copy of his book, "The Hidden Reality: Parallel Universes and the Deep Laws of the Cosmos." It explains all these different things we've been talking about. And also see our Video Pick of the Week, up there on our website. It's Brian's desk, joining some other great real estate up there. LICHTMAN: Go right in to Brian's office. LICHTMAN: See where the magic happens. FLATOW: And good luck with the book. And thank you, Flora. FLATOW: We'll go - we'll be assigning you to the next desk, as it comes up. Ah, Arizona. When AZ was the last state to make Martin Luther King Day a holiday, I swore I would never live in this forsaken backwater state - yet, here I am. Since Jami and I bought a house last summer, I guess we're stuck here for awhile, which makes the idea of Baja Arizona seem lot more desirable. This year the legislature is doing its best to destroy the state. A whole raft of far-far-far-right bills are up that will essentially make Arizona both a laughing stock and a third world state. It's shameful and embarrassing. I especially like the "Freedom to Breathe Act" that prohibits ALL federal regulations of greenhouse gases in Arizona. Maybe "freedom to gag act," or "suffocate on carbon monoxide act," or "freedom to get crispy in the AZ sun act." Oh, and I really like SB 1433, which would create a Joint Legislative Committee on Nullification of Federal Laws. It would have the power to declare federal regulations null and void in Arizona if lawmakers determine that the rules exceed the scope of powers laid out in the U.S. Constitution. And I'm sure they are all Constitutional law experts, right? Eliminating Medicare (SB 1519), which will cost the state $7 billion in federal funds, leave 50,000 elderly, physically disabled and developmentally disabled individuals, as well as 1.3 million Arizonans, without coverage. Two bills (SB 1308 and SB 1309) would override the 14th Amendment of the US Constitution and revoke citizenship rights to those born in AZ to non-citizens and create distinct citizenship rules for Arizona. SB 1405 would require hospitals to check the immigration status of patients before admitting them in non-emergency situations. SCR 1014 would ask voters to eliminate the Arizona Board of Regents (whose job is it to supervise the state universities and lobby for them in the legislature). SB 1380 is a striker sponsored by Sen. Frank Antenori of Tucson that would require the random drug-testing of welfare recipients. SB 1201, which loosens regulations prohibiting firearms in public buildings and at public gatherings, passed the Rules Committee on Monday, Feb. 28. SB 1467, which permits concealed weapons on college campuses, passed the Rules Committee on Wednesday, Feb. 23. SB 1393, which prohibits federal regulations of greenhouse gases in Arizona, moved closer to passage with a vote of the Senate Committee of the Whole last week. SB 1393 is called the "Freedom to Breathe Act" by sponsor Sen. Sylvia Allen and the "License to Pollute Act" by Sierra Club lobbyist Sandy Bahr. The "No Taxpayer Subsidies for Political Campaigns Act," which would ask voters to ban the spending of public money on political campaigns, passed the Senate on a 20-9 vote. SCR 1025, which is now headed for consideration by the House of Representatives, is a back-door way of killing Clean Elections by blocking the distribution of dollars to candidates and sweeping the funds back into the general fund. This last law was designed to provide access to public office for people who are not independently wealthy or well-connected to the folks who are wealthy, i.e., to promote democracy. You can read more about these bills and others at the Tucson Weekly: Legislative Landslide is the article the above info comes from - also check out Welcome to the Blogislature by Jim Nintzel. This article from a couple of weeks ago, has more depressing news from the legislature. The real source of my suffering is self-centeredness: my car, my possession, my well-being. Without the self-centeredness, the suffering would not arise. What would happen instead? It is important to imagine this fully and to focus on examples of your own. Think of some misfortune that makes you want to lash out, that gives rise to anger or misery. Then imagine how you might respond without suffering. Recognize that we need not experience the misery, let alone the anger, resentment, and hostility. The choice is ours. Let's continue with an example. You see that there is a dent in the car. What needs to be done? Get the other driver's license number, notify the police, contact the insurance agency, deal with all the details. Simply do it and accept it. Accept it gladly as a way to strengthen your mind further, to develop patience and the armor of forbearance. There is no way to become a Buddha and remain a vulnerable wimp. Via FORA.tv - the always thought-provoking Slavoj Zizek. The three religions of the Book each help us to differentiate the divine from the sacred. This liberating concept culminates in Paul's claim, from Ephesians, that "our struggle is not against flesh and blood, but against leaders, against authorities, against the world rulers of this darkness, against the spiritual wickedness in the heavens." Can religious fundamentalism be overcome only with the help of an emancipatory political theology? Philosopher Slavoj Zizek debates this and other incendiary questions on the LIVE stage. This event is sponsored by the Carnegie Corporation of New York. Paul Holdengräber is the Director of LIVE from the NYPL. Slavoj Zizek, born 1949 in Ljubljana, Slovenia, Senior Researcher at Birkbeck College, University of London, is a Hegelian Philosopher, Lacanian psychoanalyst, Christian atheist, Communist political activist, and he thinks these four features are four aspects of one and the same Cause. His latest publications are: in philosophy The Parallax View, in psychoanalysis How to Read Lacan, in theology The Monstrosity of Christ, and in politics Living at the End Times. This is from last week's Science Friday - nearly a week late, but it was interesting to me so maybe it will be to you as well. Some of what we learned about how the brain transmits signals may not be correct. In the traditional view of how signals travel in the brain, a portion of a neuron known as a dendrite acts as an input for stimuli, while the neuron's axon serves as a signal output. Nelson Spruston, author of an article in the journal Nature Neuroscience, says that the reality may be more complicated. Later in the hour: your brain on cell phones. But first, speaking about your brain, think back to biology class, when you learned about the brain and nerve cells. Remember those cells had long, wire-like tentacles carrying electric signals to and from the cell, the axon? Yeah, the axon carried the impulses away. You remember the A for axon and away, and signals coming into the neurons from the dendrites. Dendrites evaluate, and they evaluate whether to respond with that information, and if they do, a split-second later, the signal fires and an impulse goes down, away on the axon. It sounds pretty straightforward, right? Basic Biology 101. But a recent study in the journal Nature Neuroscience says it may not be so simple, that some neurons may respond not right after a stimulation, but significantly later. And what's more, in some cases, a signal can go the other way, up the axon, and axons can talk to other axons in some mysterious way. Wow. Joining me now to talk about it is Nelson Spruston. He's one of the authors of that paper and a professor of neurobiology and physiology at Northwestern University in Illinois. Professor NELSON SPRUSTON (Neurobiology and Physiology, Weinberg College of Arts and Sciences, Northwestern University): Thanks for having me, Ira. FLATOW: Wow, interesting new kinds of stuff about the way neurons work. Prof. SPRUSTON: Yeah, well, this really fascinated us when we made this discovery. My graduate student, Mark Sheffield, came to me one day - I still remember the day - and said: Look what's happening here. I don't understand this. And it took us a while to figure it out, but it definitely did change the way that we think about how these particular neurons are functioning. FLATOW: So he really discovered - he looked at something people had seen over the years and thought it was something wrong with the experiments. Prof. SPRUSTON: That's right. We think that probably one of the reasons it's been overlooked is people thought that something was wrong with either the cell being unhealthy or the quality of the recording conditions not being right. But Mark had the insight to realize that everything looked OK, and that if you stimulated the neuron the same way, over and over again, he would get the same kind of unusual response. And you wouldn't expect that from a cell that was unhealthy. It would start to deteriorate and not produce a reliable response. FLATOW: So let's talk about these things as individual events and separate them out. First, give us one and what was surprising about it. Prof. SPRUSTON: Well, there's two aspects of the findings that were really surprising to us, and one has to do with time, and one has to do with space. So as you nicely described, neurons respond rapidly to incoming signals, and if you think about it from an evolutionary perspective, it makes sense that it would happen that way. If you're an animal that wants to escape from a predator, you don't want to wait around for a long time. So neurons were built, really, to perform very rapid signaling, and this is the way we usually think about how things work. But the thing that we noticed about these responses is they generated a form of response that seemed to be sensitive to what was happening with stimulation on the time scale of a minute or two minutes. So if you stimulated the neuron repeatedly for a couple of minutes, it would go into another state of firing. FLATOW: You mean, it would be - there would be a big delay between the stimulation and the response? Prof. SPRUSTON: Yeah, that's right. So a minute or two of stimulation, and then suddenly, with a very rapid onset, the neuron would begin responding in this very long fashion. So again, the output would last for a long time, about a minute or so, and the firing - when we talk about firing, we're talking about action potentials in axons. And those action potentials had some very unusual characteristics, as well, that led us to believe the neuron was in a different state than the conventional state where it's responding rapidly to a stimulus that's arriving. FLATOW: And what about the idea that the pulses in the axons can go in different directions? Prof. SPRUSTON: Yeah, so that's where the idea of space comes in. As you nicely described at the top of the program, the way we usually think about it is the dendrites are the receiving structure of the neuron, and the axon is the output structure. In this case, because of the unusual nature of the signals that we recorded during this persistent firing state, we thought that the action potentials were likely coming from the axon. And it looked to us like the axon was actually integrating the stimulus over this period of a minute or two that leads up to the persistent firing. So it looks like the axon, in this particular behavioral state of the neuron, is functioning both as an input structure and an output structure. FLATOW: Wow. No wonder you always thought there was something wrong with the measurement, because no one - this is so unusual. Prof. SPRUSTON: Yeah. So it took quite a bit of work, actually, to really understand what we were seeing. So we had some insights both from experiments that we had done in the past, as well as computational modeling. And, you know, we do - one of my colleagues, Bill Kath and I, work together a lot on making computer models of neurons. And computer modeling of neurons, I think, is a really powerful approach, and it allows us to see things and recognize things as unusual that we might not otherwise pick up when we're doing the experiments. FLATOW: Now, let's talk about this third aspect, which is - it appears that axons are talking to one another. Prof. SPRUSTON: Right. So this was perhaps the most surprising aspect of our work, was we did recordings from pairs of these particular types of neurons that exhibit persistent firing. And we found that in some cases, when we stimulated one neuron, one of the two that we were recording from, the other one, the unstimulated one, would go into this persistent firing state. And there were no - none of the usual indications that the two neurons were connected in a conventional way by synaptic connections. And so we think we've identified an unusual form of communication that occurs between the axons of these neurons. FLATOW: So how do they - spooky action at a distance, like the physicists would call it? I mean, how would they connect? Prof. SPRUSTON: Well, there's got to be a physical substrate for the interaction, of course. One possibility is that the axons are connected by structures called gap junctions. That's an idea that has been proposed in the past. Another possibility is that there are actually synaptic connections between the axons themselves, although we think that that's unlikely. We still need to do a lot more work to really understand this, but we think it's unlikely that there are synaptic connections. The third possibility is that there's some sort of intermediate structure. So, for example, a non-neuronal cell, or a glial cell in the system is responding to stimulation of one cell and then generating a signal to which other cells in the immediate vicinity could respond. FLATOW: So even after all these years of studying nerve cells and brain cells, there may still be structure there that we have not discovered? Prof. SPRUSTON: Yeah, that's the - that's really the amazing thing. And I think it really highlights the need for this kind of research. I mean, we have to really understand how the component parts of the brain function if we want to understand how neural circuits function, how they control behavior and what goes wrong in various diseases. I think we really have to be doing basic research. And sometimes findings like this really take you by surprise and make you realize: Wow, we really understand things a lot less than we may have thought. FLATOW: Isn't science like that? Prof. SPRUSTON: It is. It's what makes it exciting, actually. It's what makes it fun to do science. FLATOW: I understand that, but the idea that there may be diseases connected to this, there may be a new mechanism for neuronal disease or brain disease or dysfunction that we never thought about might be somehow locked up in a structure we never knew about. Prof. SPRUSTON: That's right. I mean, I think that when people go looking for causes of diseases or, let's say, neuronal manifestations of neurological and psychiatric disorders, you think about that in terms that you understand, in the way that we know how neurons function and how they communicate with each other. For example, Alzheimer's disease is thought to be a disease that affects the synapses, the connections between neurons. If there are unknown forms of communication, then we have really no way of identifying that those forms of communication might be involved in diseases. And there are lots of candidate diseases for this particular part of the brain that we're studying, and maybe this is a contributing factor. Prof. SPRUSTON: So, the two diseases, neurological diseases, that affect the hippocampus the most or most commonly are epilepsy and Alzheimer's disease. There are also psychiatric diseases like schizophrenia, depression and anxiety. The hippocampus has been implicated in being involved in all of those diseases. And again, if we want to understand how this structure, the hippocampus itself, is affected by disease, we need to understand in great detail how the individual neurons work and what the molecular mechanisms are for the various types of behavior that they exhibit. FLATOW: You keep saying we need to understand. How do we proceed? Prof. SPRUSTON: Yeah. Well, I think that, you know, there's a lot of different approaches in neuroscience. There's a lot of fancy, expensive equipment. There's new developments in technology that are truly fascinating. And - but I think the most powerful approach that we have is collaboration. I think that the brain is such an incredibly complex organism that there's no single approach that is going to solve the problem. And I think that bringing together smart people with different approaches to studying the brain - some studying its structural features, some studying its functional or physiological features, others studying its molecular composition - having those people collaborate together, I think, is the key to trying to understand how the brain works. And I mentioned before the power of computational modeling. I think what we need to do in neuroscience is bring together facts that have been learned from experiments of different types and bring them together and integrate those findings in the form of computational models. And, for example, you know, the NIH has supported the work that we've done in part through a program that is designed to bring together people doing experiments and people doing computational modeling. So it's a joint effort by the NIH and the NSF to try to really get people bringing together information from various types of experimental approaches and bringing them together specifically in computer models. FLATOW: And a computer model, briefly, is trying to model how the brain works, but on a computer? Prof. SPRUSTON: That's right. And you can do that on many different levels. So, for example, you could make a computer model of a large circuit of neurons. You could make a computer model of an individual neuron. You can even make computer models of small parts of neurons. And the idea is to bring together knowledge in a very quantitative fashion. You know, you think you can understand that doing X causes Y in a neuron. Well, now do you have a system of quantitative equations that can really explain that behavior in a reliable fashion? And as I mentioned before, sometimes because these models become very, very complicated, they sometimes lead to surprising behavior that's unexpected. And when you see that unexpected behavior, it allows you to identify new experiments that you might never have thought of otherwise. FLATOW: Well, Dr. Spruston, thank you very much for taking time to talk with us today, and good luck to you. Prof. SPRUSTON: I appreciate the opportunity to be here. Thank you. FLATOW: Nelson Spruston, professor of neurobiology and physiology at Northwestern University in Evanston, Illinois.